Shh! Secret cats! | More blue fabric? This may look like a polka dot dress, but it harbours a secret. A rather feline secret. 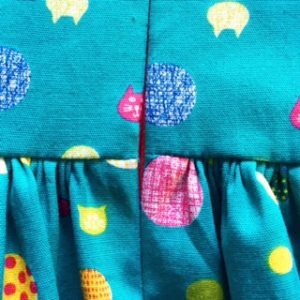 Because some of the polka dots are secretly cats! The fabric is a lovely cotton called Happy Pop that I bought when we were in Japan last year. Aside from the secret cats? I made a couple of alterations to this after having made the underground dress, and it’s all the better for it. I could probably still take another centimetre off the straps, but otherwise it’s fitting and looking much better. I also found the fabric was wonderfully easy to pattern match as the different cats made it easy to know where to lay out the pieces. Honourable mention should go to the insertion of the invisible zip in this dress, which I expected to be a nightmare but which was near perfect (to my standards!) as you can see above. 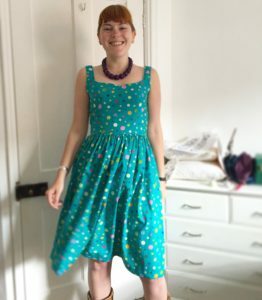 Quite probably, I love the sit of the neckline on this dress and I have some lovely cotton I bought on ebay that is waiting for something like this…. < Previous Space dress! Again! I love the colours in this print (and the secret cats of course ;o) Fabric is the best souvenir!